Keep raw materials, manufacturing supplies and finished products moving. These rolling carts and storage carts continue the Dimension 4 construction and style. 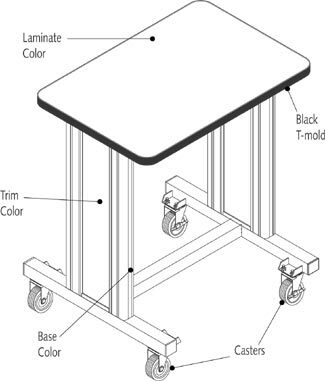 Complement your Dimension 4 Workstations with the material handling equipment needed to enable true production efficiency. 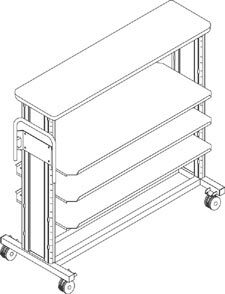 D4 Rolling Carts provide a platform for equipment or supplies that need mobility. Optional shelving adds even more storage area. 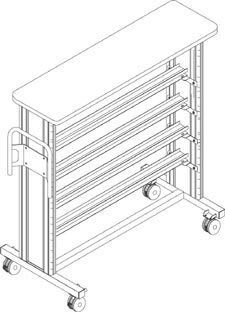 D4 Rolling Storage and Equipment Carts are designed for moving parts and supplies around the production floor to where they are needed. Up to 500 pounds of supplies is easily moved with a handle that is ergonomically designed for comfort and safety. Standard Lengths: 24", 30", 36", 42"
Standard Depths: 24", 30", 36"
Standard Height: 30", 32", 34", 36"